Apple iPad 2, the most awaited tablet PC of 2011 is finally official. It is a successor of iPad which needs no introduction. iPad was released in 2010 and millions of iPad has been sold. 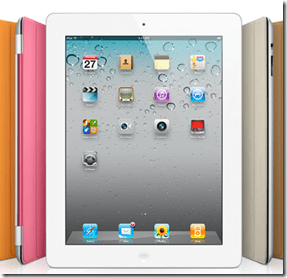 iPad 2 was unveiled on 2nd March.So what’s new in iPad 2? The first thing you will notice that it is much slimmer and lighter than the original iPad. It is only 8.8 mm thick! compared to the original iPad has 13.4 mm thickness. iPad 2 comes with 1Ghz Dual-core A5 processor which is twice faster than A4 processor.The graphics department has also been upgraded.iPad 2 has 9 times faster graphics than iPad. You don’t need to be worried about battery life as iPad 2 can run 10 hours from single charge.It has same screen like predecessor i.e a 1024 x 768 resolution IPS LCD screen. iPad 2 has two cameras front and rear camera.The front camera is capable of shooting videos of VGA resolution at 30 fps and the rear camera can record 720p HD video at 30fps.iPad 2 has HDMI connectivity via A/V adapter. Along with iPad 2 iOS 4.3 is coming with much improved Safari performance and apps like FaceTime, Photo Booth, iMovie etc. iPad will be come in two different colors – Black and White.Pricing is similar to original iPad like the 16GB Wi-Fi only version will cost $499. It will start shipping from 11th March.